You certainly don’t have to be German to enjoy this This Skillet German Potato Salad is darn near the best potato recipe I have ever made. So savory and full of so much flavor. You can boil the potatoes and mix the dressing ahead of time. That leaves more time to concentrate on the rest of the meal or your cocktail. Believe me I have tweens here so cocktails are a necessity not an option!! The first time I made this my husband said “Oh my goodness what are you doing to the potato salad.” I told him “I am putting it in the skillet to crisp the edges and to make the flavors more intense.” He loved it. 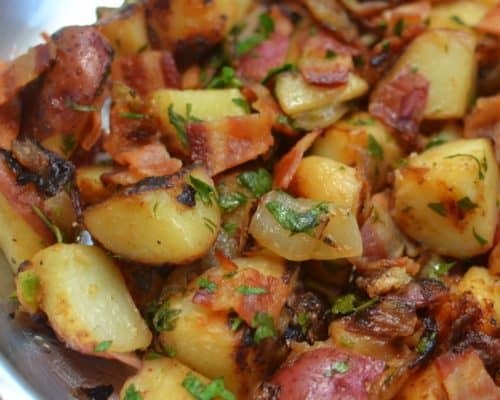 He said “Who would have thought that would work out so well.” I said “You don’t know unless you try something new.” So this traditional style German Potato Salad gets a bit of a twist by way of a hot skillet with a little bacon grease. This Skillet German Potato Salad is best served warm. How do you make Skillet German Potato Salad? First parboil the potatoes, drain well and cut into bite size chunks. Cook the bacon in the oven until it is crispy and then chop coarsely. Reserve the bacon fat from the baking sheet. Whisk together the vinegar, sugar, water, olive oil and Dijon mustard. Add 2 tablespoons of the bacon fat to a large skillet. Add the chopped onions and cook a couple of minutes. Spoon in the potatoes and cook until crispy on the edges. Drizzle in the vinegar dressing in three parts cooking one to two minutes between each part. Stir in the chopped bacon and parsley. Serve immediately. That is it folks. It does not get any better or easier than that to make the one of the finest potato salads you will ever have. What makes German Potato Salad different from American Potato Salad? German potato salad dressing is usually vinegar based with bacon and served warm. While most American based potato salad dressings are mayonnaise, mustard or sour cream based and served cold. Both are delicious albeit quite different. 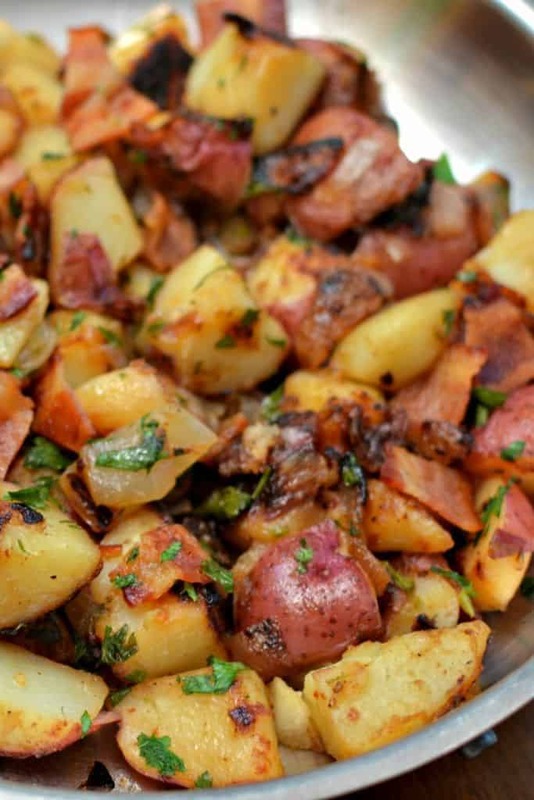 Red potatoes are best in this potato salad. They are a little waxy and they keep their shape well. The dressing can be mixed up to several days in advance and stored in an airtight container in the refrigerator. To get your potatoes nice and crispy do not stir too often. Just let them cook undisturbed for several minutes. If necessary set yourself a timer so you don’t stir too much. Don’t add the bacon and parsley until after the dressing has been added and you are ready to serve. So do yourself and your loved ones a huge favor and try my Skillet German Potato Salad. You are going to love it and your loved ones will be singing accolades. Are you a spud loving family like us? 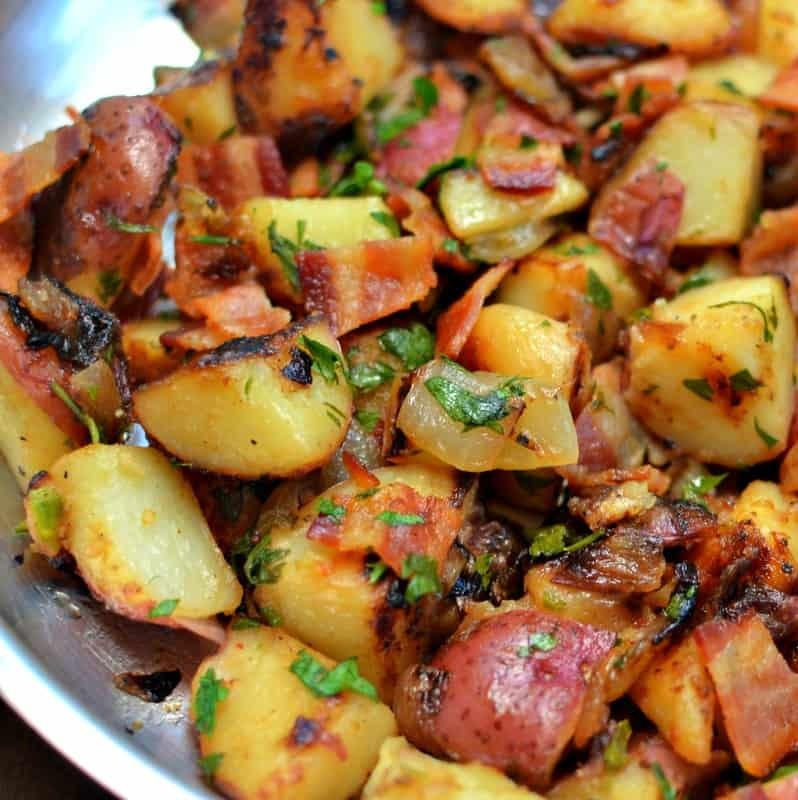 Here are some more fabulous potato recipes you must try. This post was originally published August 19, 2016 and was republished March 30, 2019 with new content. Wish I could save it on pininterest! Try again. I was having some trouble yesterday. This looks great and I will make. Thanks for all of your delicious recipes. You are most welcome. My pleasure! This is just like my grandmothers German potato salad ! I have made it since I was 14yrs old …. It’s the best ever!! And now I’m 52.. she taught me how to make it personally !! I still her so much. How sweet. Such great memories you hold in your heart. Thanks for sharing that. 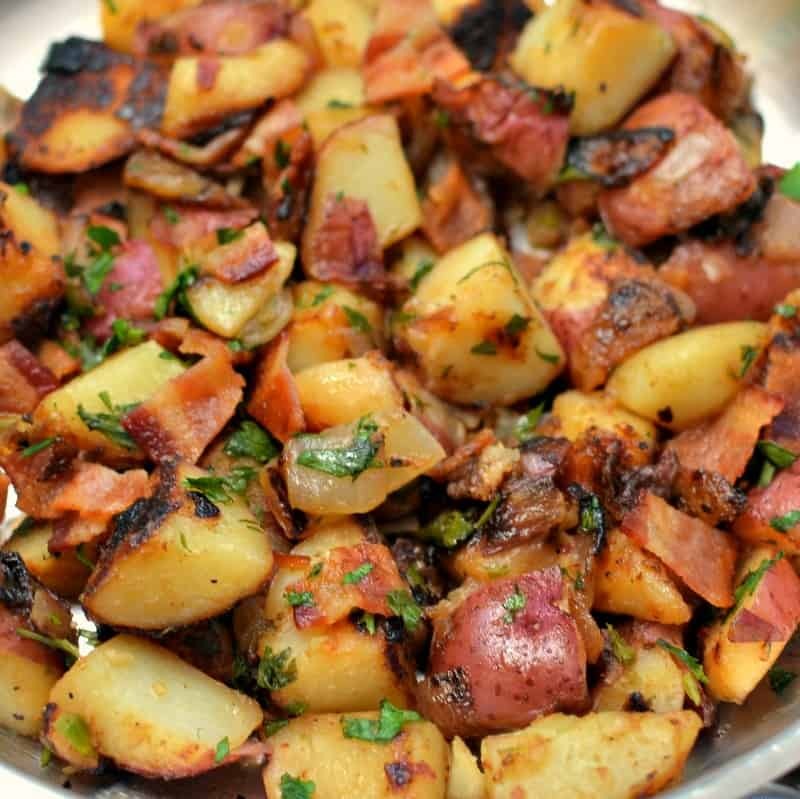 I grew up eating German Potato Salad from the Plandome Deli, Manhasset NY ….. It was a German Deli … delicious . I now make my own, this is a good recipe … I use a little more vinegar. .. I like that first bite to make my tongue curl ! Grew up on fried potato German potato salad. Been on my favorite list for over 70 years. Fry up the onions ,spuds in big iron skillet. Dont hold back on the sauce. Plenty of dark mustard , vinegar and carmalized sugar. Crumble on bacon. Brown up the links and enjoy!! Is my mouth watering or what. Cassarol in the old dutch oven. Works that way also. Love this recipe. Almost identical to what my Mother made. She used bacon grease instead of the olive oil. She would also brown the potatoes but placed cooked potatoes in a bowl then heated the vinegrets in the skillet with bacon grease. She got it boiling hot, pulled over potatoes and then tossed lightly. This was the real German version she was taught from my Grandmother. Sounds amazing and close to my recipe! Good times and great memories! These look like they would make some awesome breakfast potatoes! I would love to pair these with an omelette one morning! Yum big fan of this recipe! Always a hit! This will be my new side dish! Delicious! The addition of bacon makes everything better, isn’t it? Yummy! This is my kind of potato salad, yum! Thanks Kimberly! It is delicious! Thanks so much Jennifer! We love them too! Omg, looks really yummy! This is one of my favorite side dish, definitely having this on our table!